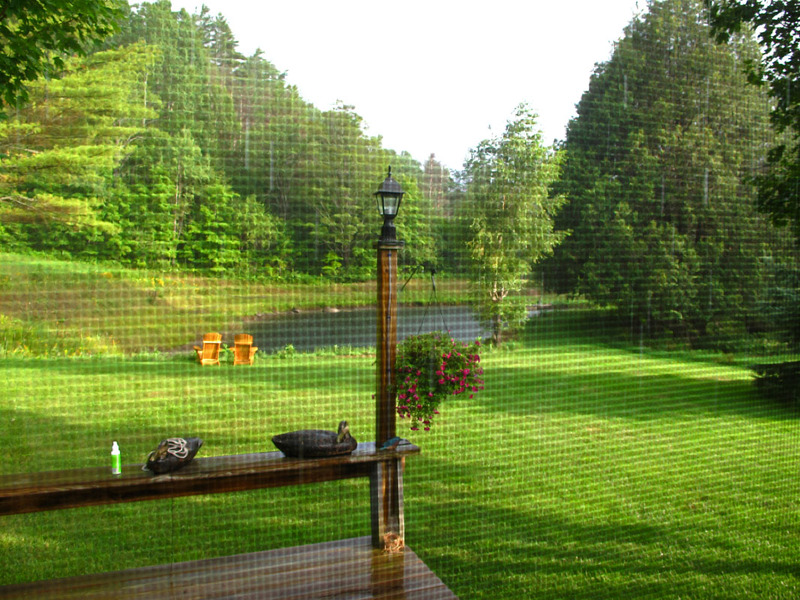 8/16/11 – The final leg of the library road trip started in the rain at the Farm in Vermont. 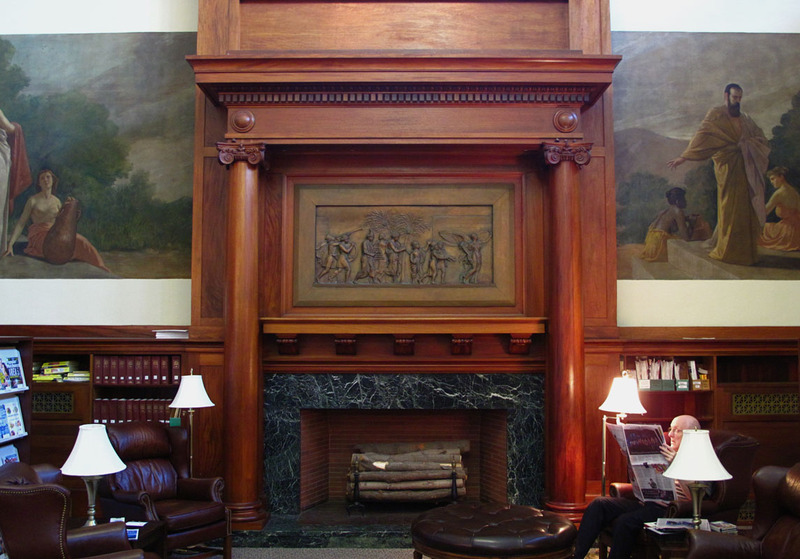 We were finishing this epic journey by photographing four libraries in New England. We were also driving Walker down to New York City to begin his junior year in college. Just as we arrived in Laconia, NH the rain stopped. 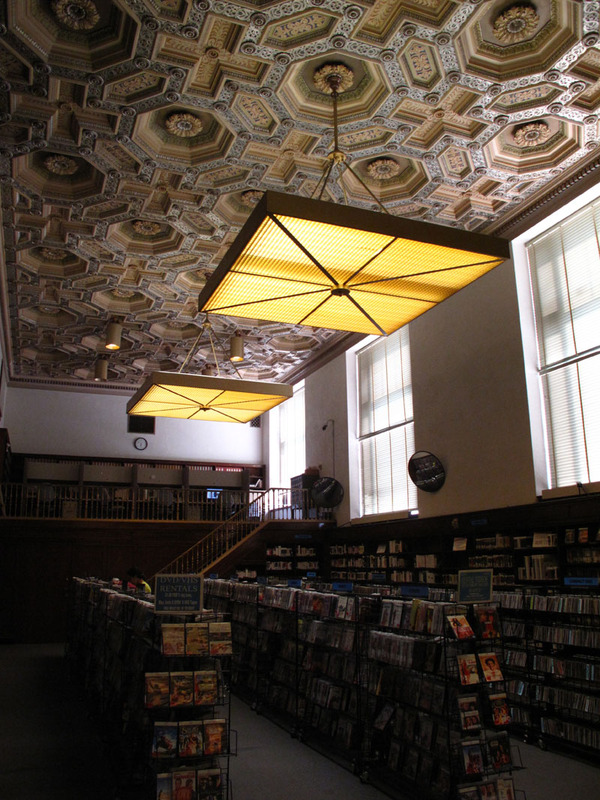 I photographed the amazing Gale Memorial Library there. It had a great display on local summer stock theater as well as striking architecture. I had feared that the rain would return and stop my photography of the fascinating exterior. Fortunately, it really was stopped for the rest of the day. Ellen had spent her childhood summers in this area and we visited several places that brought back strong memories for her along the way. 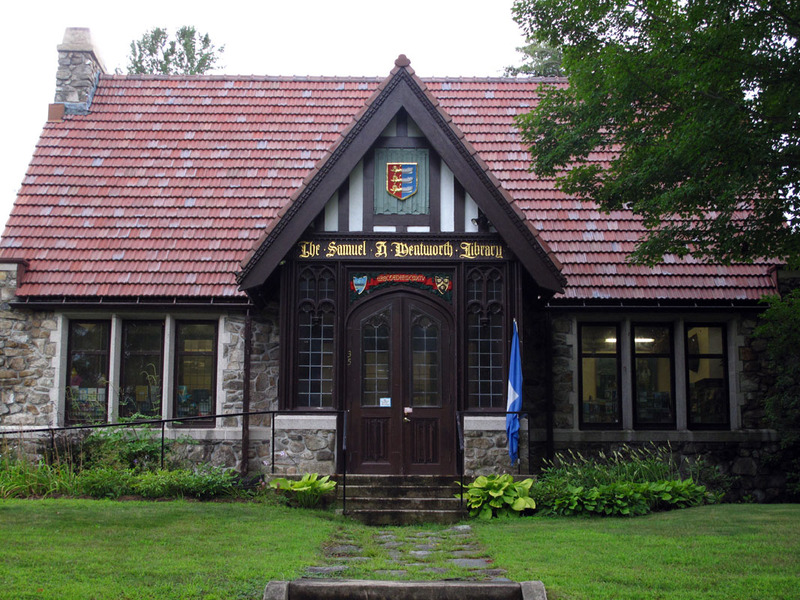 The Samuel A. Wentworth Library at Center Sandwich, NH was a delight. We didn’t think that we would have time to photograph it and it turned out to be an eccentric surprise in this remote part of New Hampshire. We continued east past the Presidential Range Mountains and thickly wooded forests into Maine. 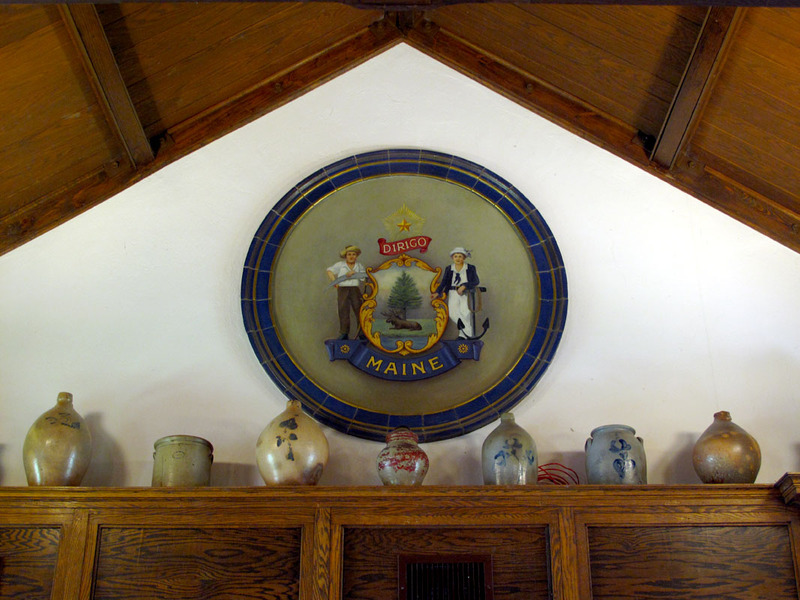 We stayed with our wonderful friend Jacqui Koopman who lives near Portland, ME. We had so many stories from this trip that we stayed up to the wee hours telling only a few of them. 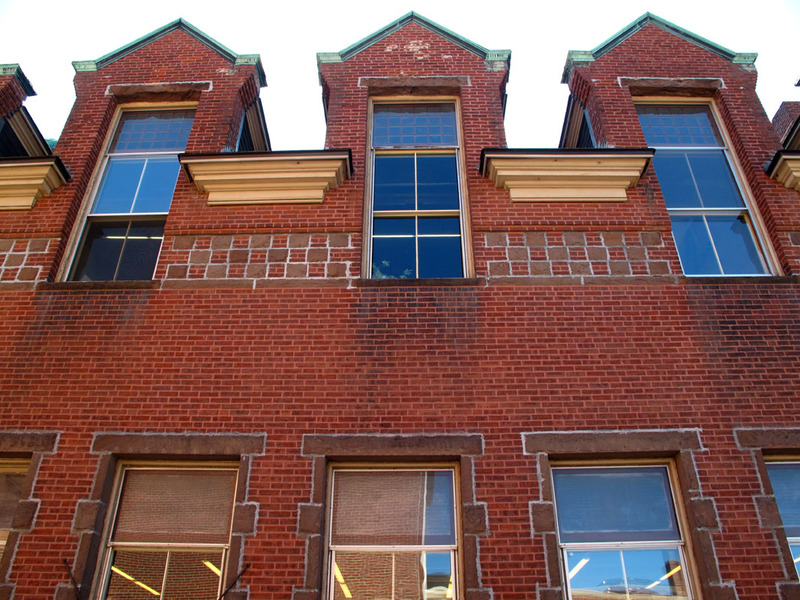 8/17/11 – I photographed only one library in Maine but it was a good one. After I explained my project to the friendly librarian in Gardiner she said that I should do a whole project just on Maine libraries. It dawned on me that I probably should do a more in-depth study of libraries in all fifty states. It is just time and money. With enough of each I could do it. The library in Gardiner kept me busy for over an hour and a half but eventually I pulled myself away. We drove for many hours to my last library of the summer. 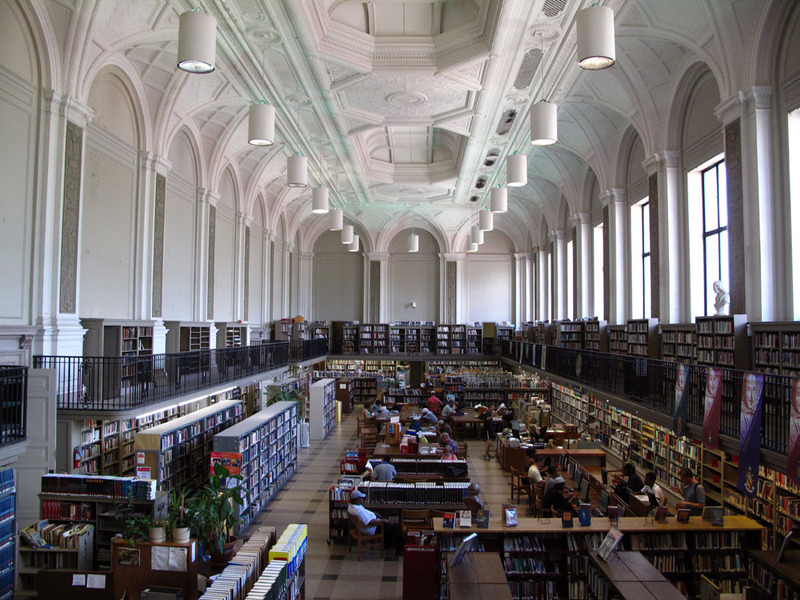 The Pollard Memorial Library in Lowell, MA was a great one to end the library road trip. I had always wanted to photograph here because this was the home town of writer Jack Kerouac. Apparently, he skipped a lot of school to spend time among the stacks of this library. Local legend has it that he was also found passed out in the stacks later in his life. 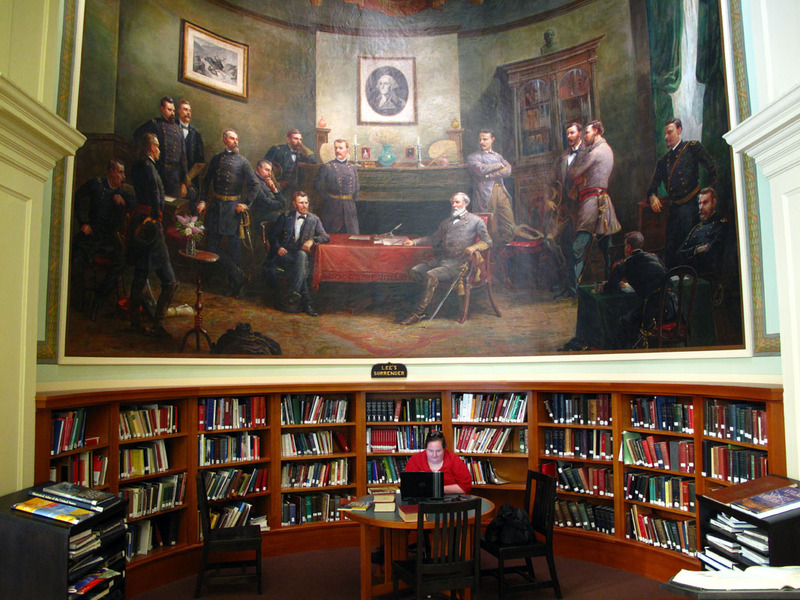 This Civil War memorial library was filled with huge murals of Lee’s Surrender at Appomattox and General Grant in the battlefield. 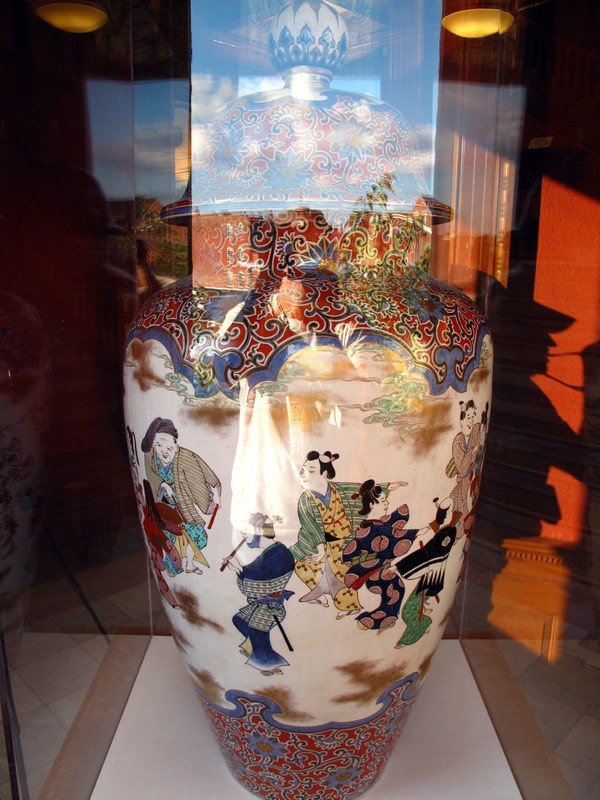 The library also contained a huge Chinese Vase and stunning interior architecture. While Walker and Ellen checked their iPhones in the library I went outside to finish with a few shots of the incredible exterior in the late afternoon light. 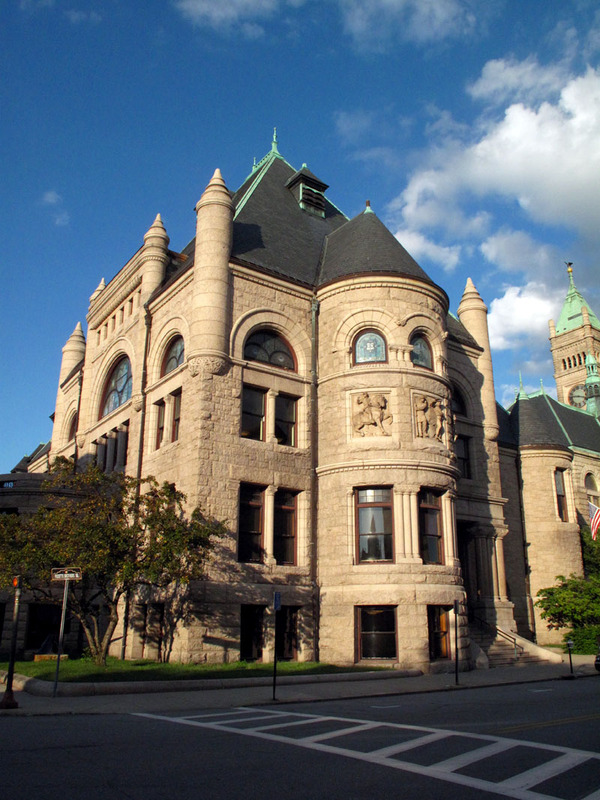 Lowell is known for its closed 19th century cotton mills and its large Cambodian-American and African-American population. The streets were teeming with people as the warm evening approached. I began to attract some attention on the street so I texted Walker to come out and watch my back. I took the last photos and we drove on to stay with Ellen’s sister near Boston. The following day we drove to Walker’s new apartment in Brooklyn. We had dinner that night at a Uighur restaurant in Brighton Beach after driving through an awesome thunder and lighting storm. Our final night on the East Coast was spent enjoying my birthday dinner with our dear friends Stanley and Lynn. At the same time we watched another torrential downpour outside. 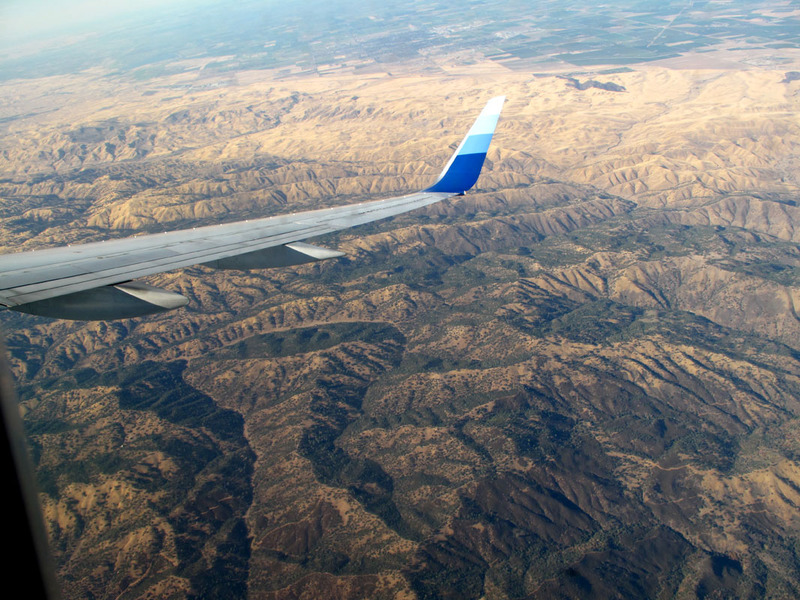 This last post was written as Ellen and I were flying back to San Francisco while Walker moves in to his new place in Bushwick. 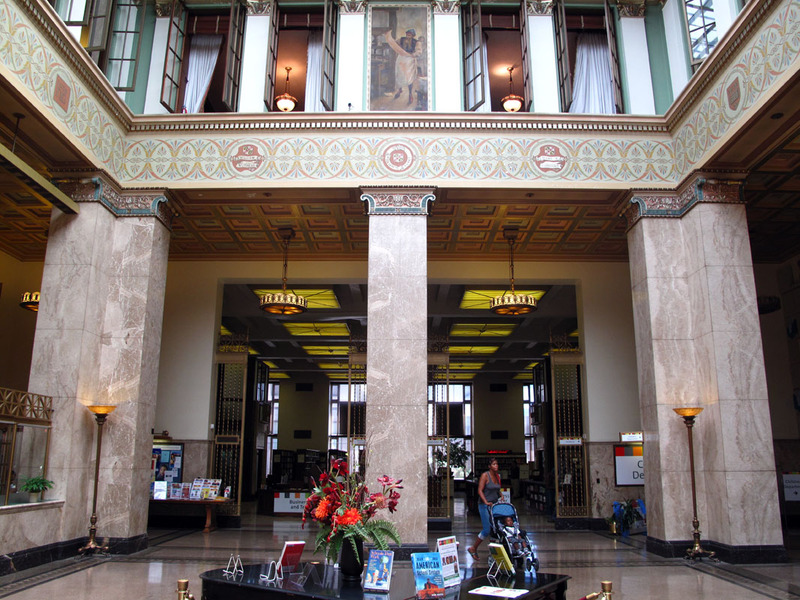 This trip has produced many great experiences and, I hope, great photographs of public libraries across the country. 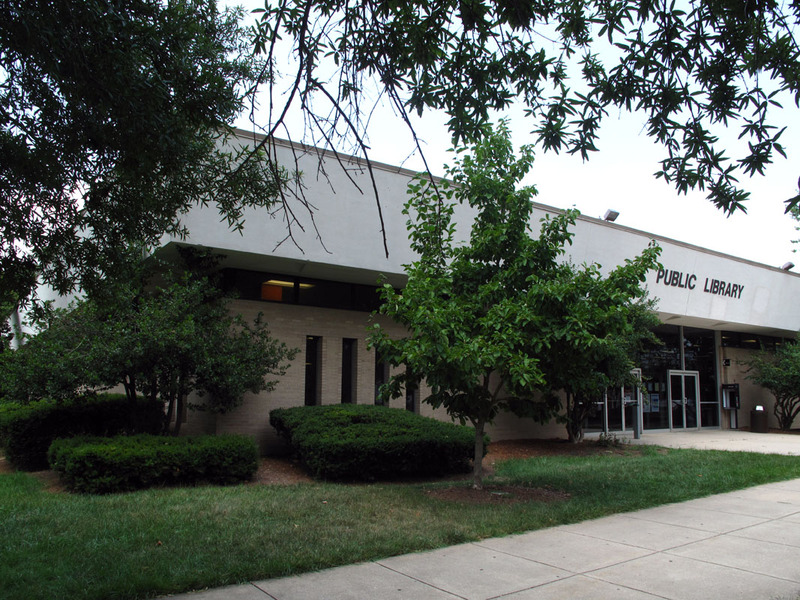 I photographed 189 libraries in 26 states and the District of Columbia. We were on the road for 58 days while driving 11,123 miles. Our Kickstarter funding campaign on the web succeeded in raising more than our $8,000 goal from friends and strangers alike. I am very excited about going home to develop all of my film. In the next few weeks I will begin to see what were the results of this extraordinary trip. I will post the greatest hits from the summer over the next few months. Thank you for reading my blog and for your interest in my project. I hope you enjoyed this wild ride as much as we did. Please stay in touch. I will keep you posted as I develop the next big phase of this project which will be the book. Stay tuned. 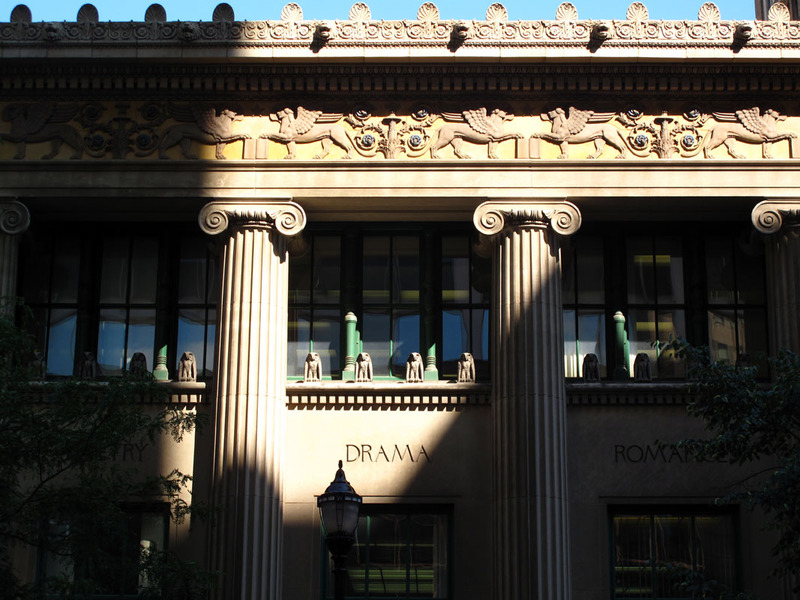 8/12/11 – I decided to spend two days photographing some of the important libraries of New England. 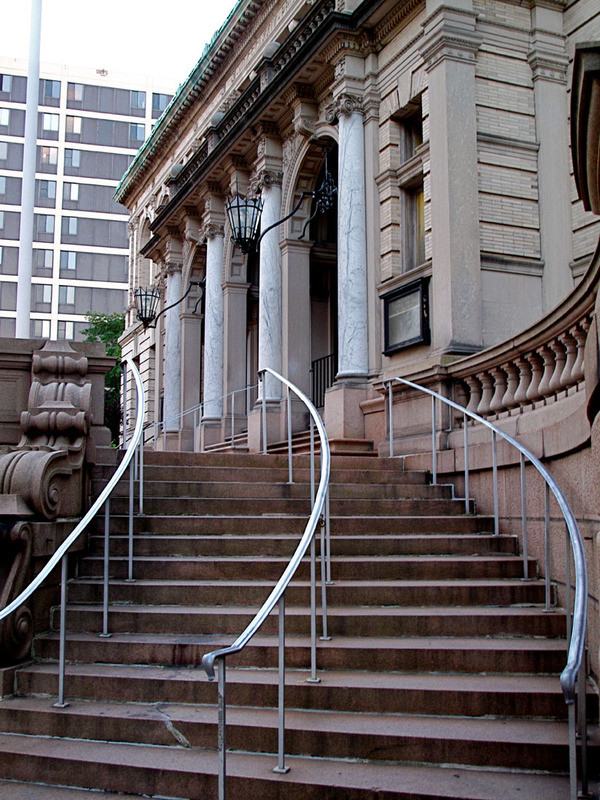 I have been photographing New England libraries since I began the project in 1994. This part of the country is where the idea of public libraries began and there is a rich heritage of significant libraries still here today. Also, it is rare when I have my 4X5 camera here so it made sense to do a mini New England library road trip. 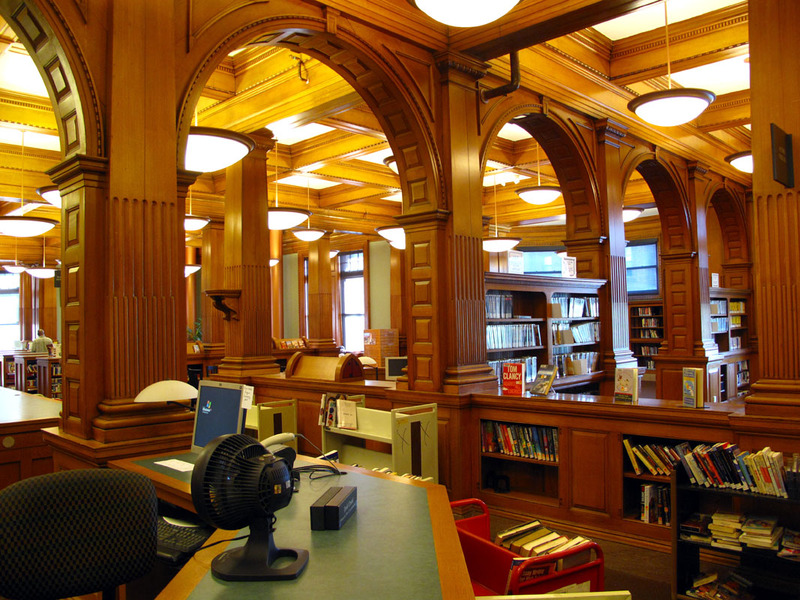 Most of these libraries are old and built by private benefactors. 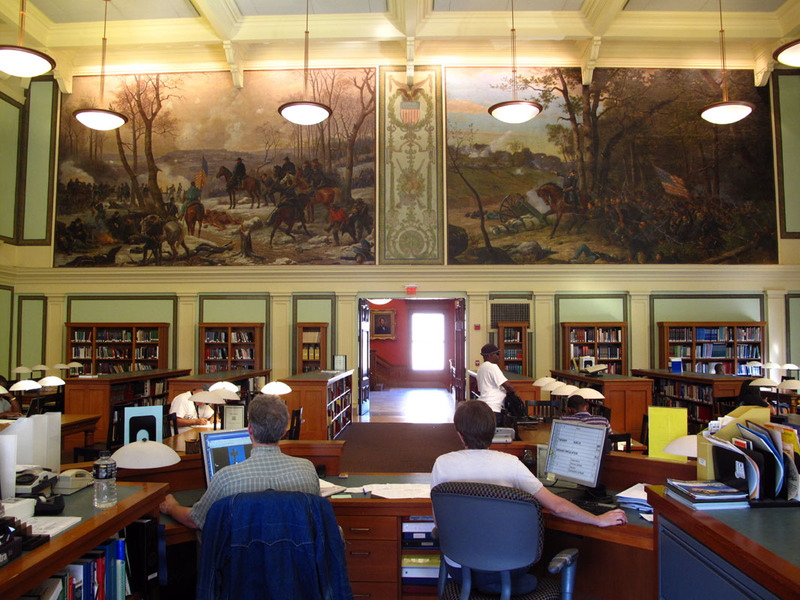 The Field Memorial Library in Conway, MA is a case in point. 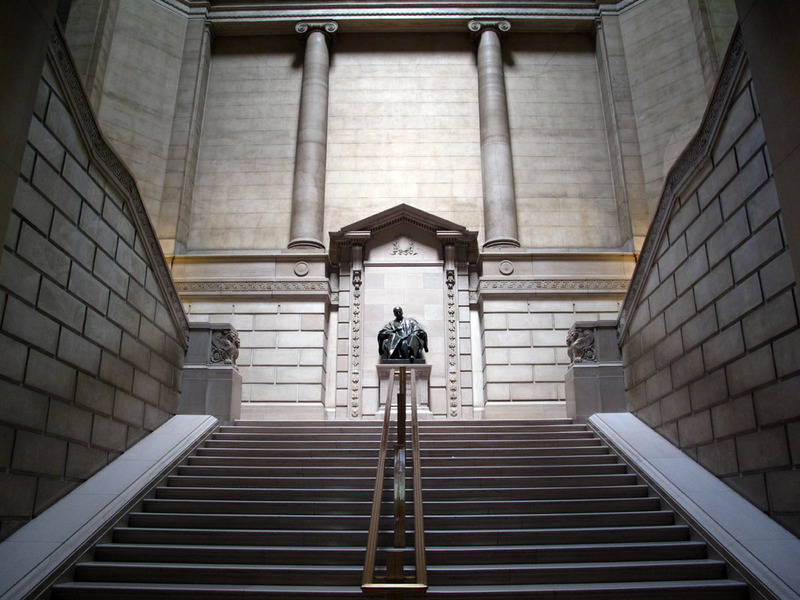 Built by funds from Marshall Field, the famous department store owner, it is both a monument to his civic-minded generosity and perhaps a monument to himself. This was one of several libraries I found that were stunningly beautiful and surprisingly out of scale for the small New England towns in which they were located. 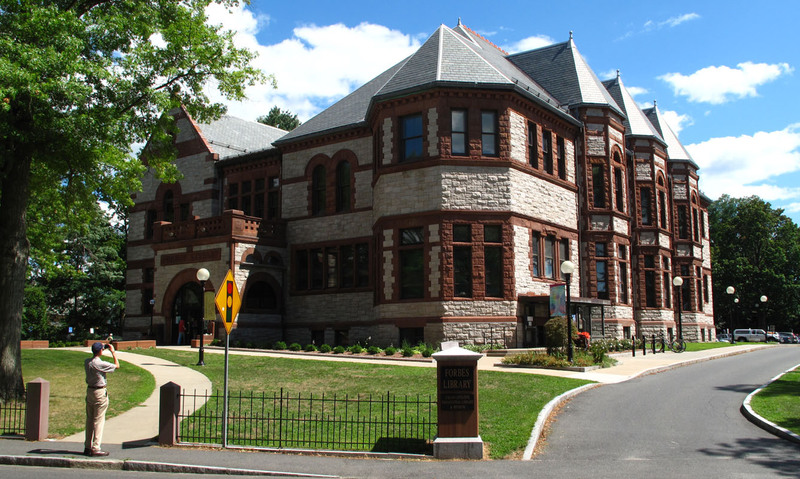 The Forbes Library is located in Northampton, MA and is also home to Smith College. 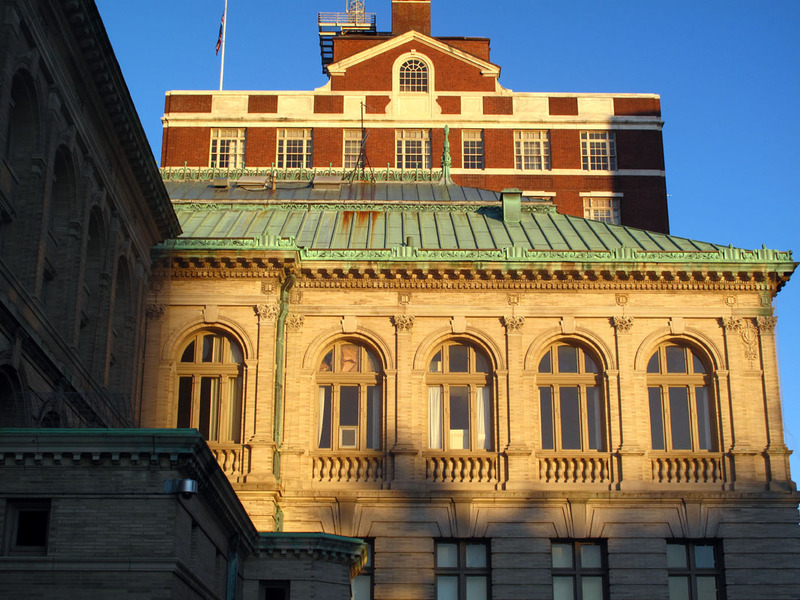 Opened in 1894 this library is one of the only public libraries in the nation that is also home to a Presidential Library. 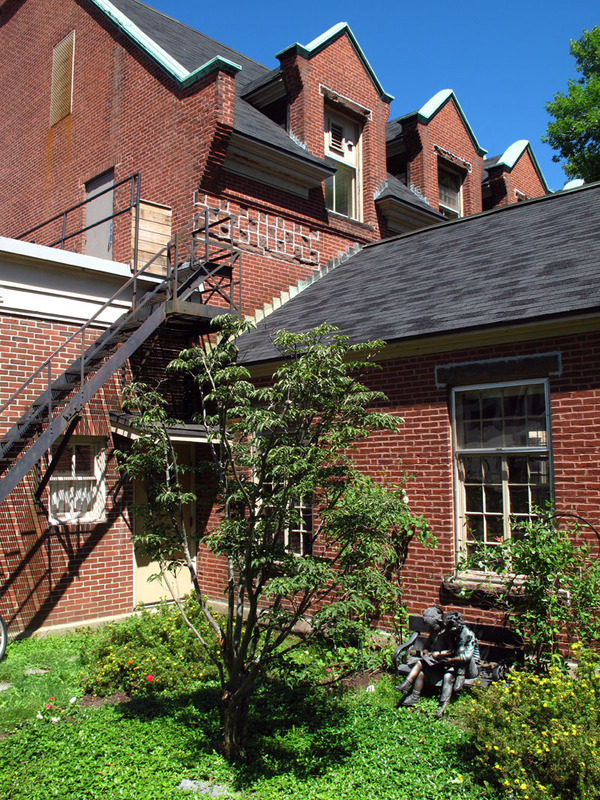 It houses the Calvin Coolidge Presidential Library and Museum. The librarians here were wonderful and gave me free access to every part of the magnificent library. 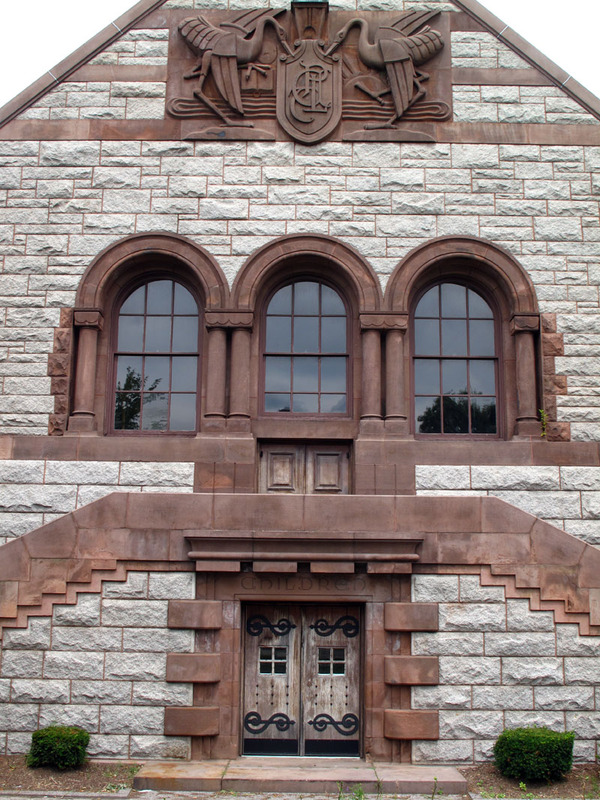 I had hoped to travel down to photograph the library in Branford, CT and several other libraries along the coast of Connecticut. However, the drive had been long and I had many miles to go before I stopped. I drove just across the border into Enfield, CT. I went to the Pearl branch library that was built by Carnegie. It had a wonderful reading sculpture of kids inside. As I was lying on my back trying to shoot it from below a nearby library patron launched into a long spiel on why Christ was the only way. I apologized that I couldn’t engage him in conversation because I was too busy taking pictures. I got out of there as soon as I took the last photo. From there it was a long drive to Worchester, MA. I was listening to public radio the whole way. Downtown Worchester was surprisingly sketchy. I took my view camera and tripod over to the library and got the overwhelming sense that I should not be there alone, under the dark cloth. Memories of being socked in the jaw in Braddock, PA came back and I beat a hasty retreat back to my car. After another long drive I arrived in Providence, RI. The sun was setting and I quickly set up my camera and photographed the beautiful back of the Main Library. I could hear a loud protest coming from the other street that got louder as I walked around to the unused front of the library. As I set up my camera to photograph the beautiful stairway a group of striking Verison workers came over. They thought I was the Press and desperately wanted to tell me their story. They explained that they were striking over job insecurity with many of their jobs being shipped overseas. I had heard about this strike before and the situation sounded pretty bad. I didn’t know who to believe but my sympathies naturally went out to these workers dealing with corporate America. seen on the trip. The outside wasn’t too shabby either and I photographed there for an hour and a half. 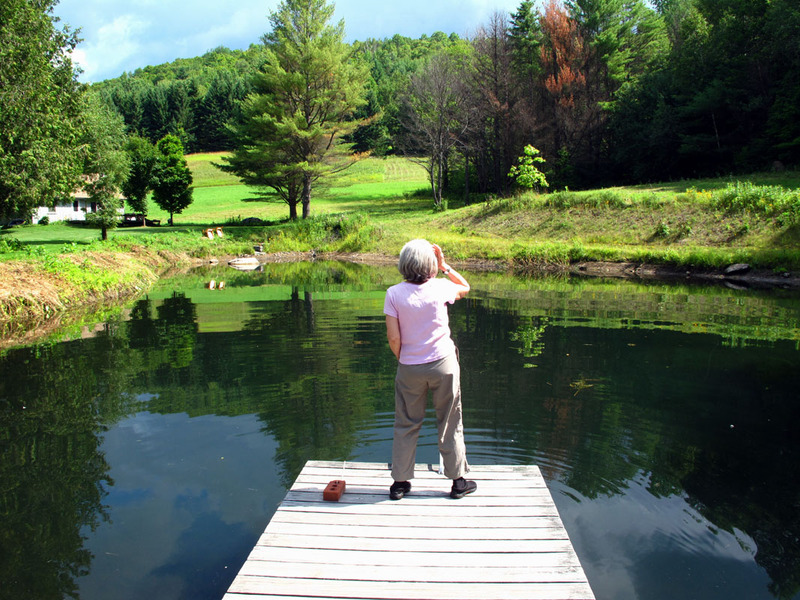 Three hours later I was back at the Farm in Vermont for another great family gathering and dinner. 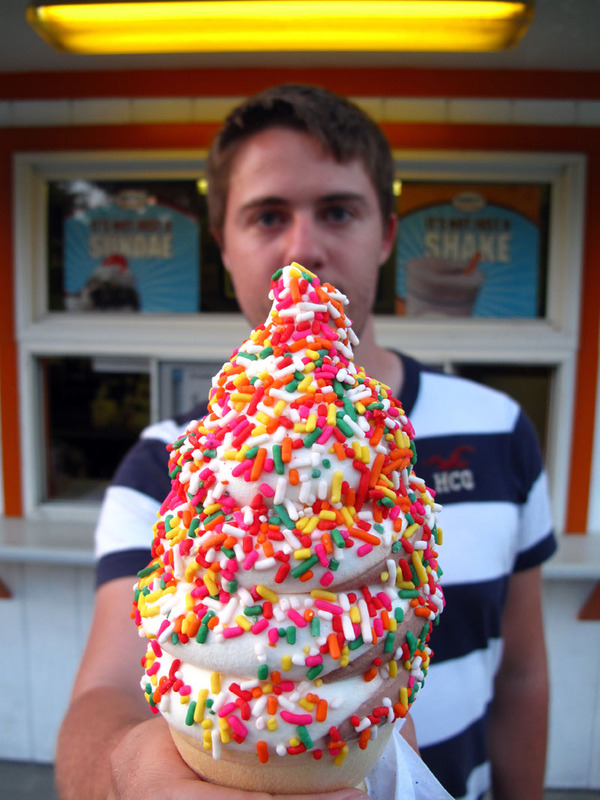 sprinkles on his. I want to thank all of our generous supporters who made this trip possible. It was a gamble not knowing when we started if we would reach our goal. Kickstarter made reaching the goal important by making it all or nothing. But it paid off and now I know this project will become a reality. 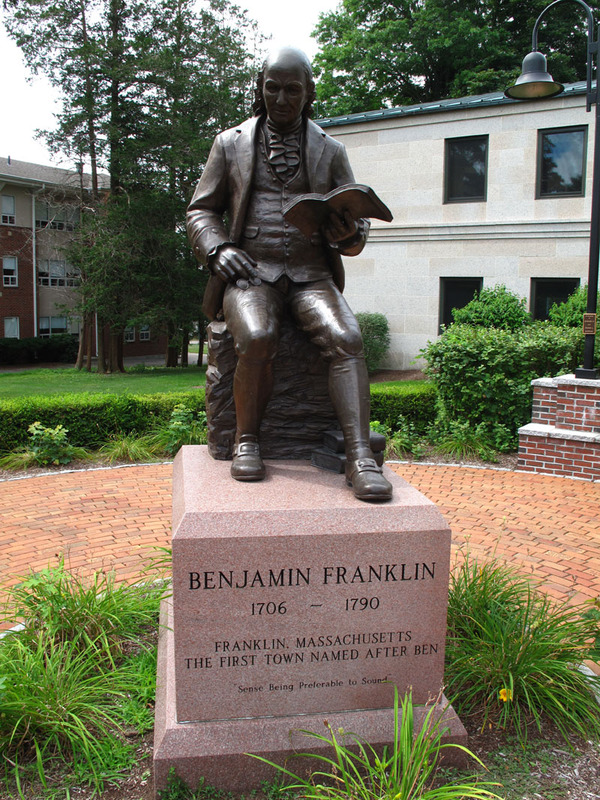 Finally, New England has a long history of visionary, progressive thinkers. One of them was the 19th Century U.S. Senator Justin Morrill who happened to grow up in the tiny, nearby town of Stafford, VT. Among his accomplishments was starting the system of Land Grant Colleges in the United States. His family was too poor to send him to college. Because he saw the need he later established these high quality, low cost colleges in each state of the Union. 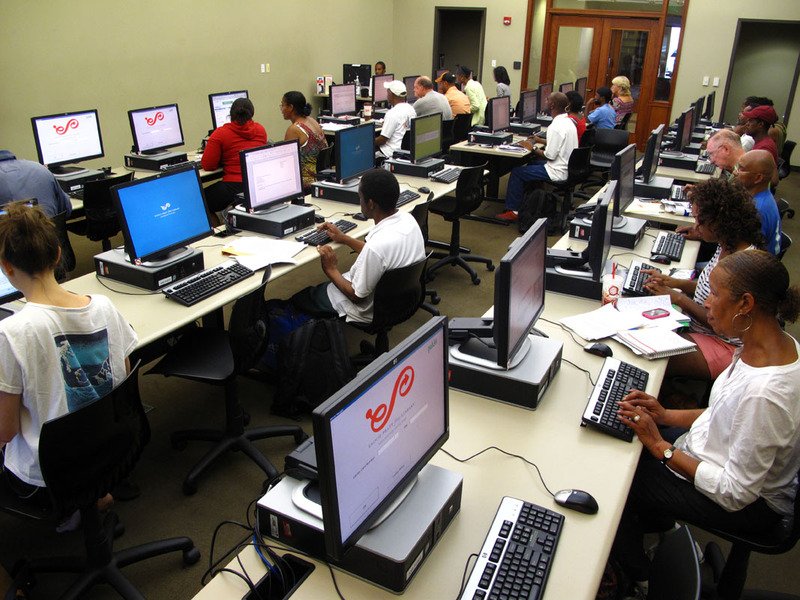 His goal was to provide free access to information for everyone that wanted the chance of improving one’s life. 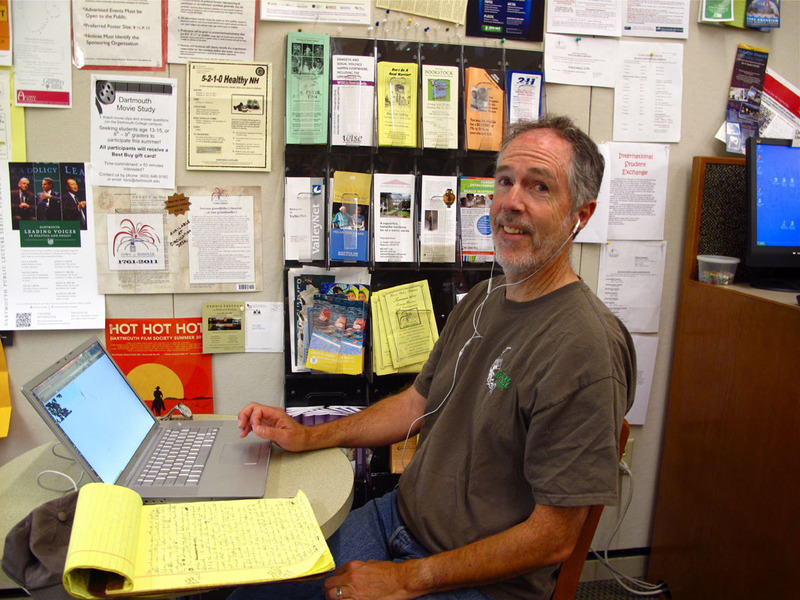 The small Justin Morrill Library in rural Stafford has free wifi that is available 24/7. Like many of the small, rural libraries we saw on the trip this is the only place for miles to connect to the internet. I photographed Walker in our car with the glow of the computer screen on his face using the free access to information from the darkened library. I imagined that Justin Morrill would be pleased. 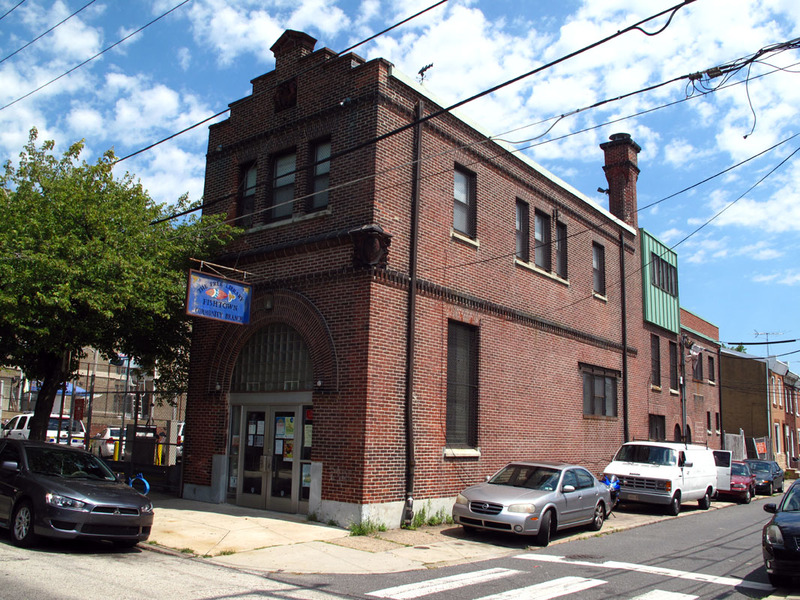 7/31/11 – The Fishtown branch library in Philadelphia is special. As I am photographing outside an old biker-looking guy came over and explained that his mother helped save the library from becoming a parking lot for the nearby police station. When the library was rededicated the mayor of Philadelphia came over and offered to give his mother a ride in his limo. She refused choosing to walk the one block instead. Classic! 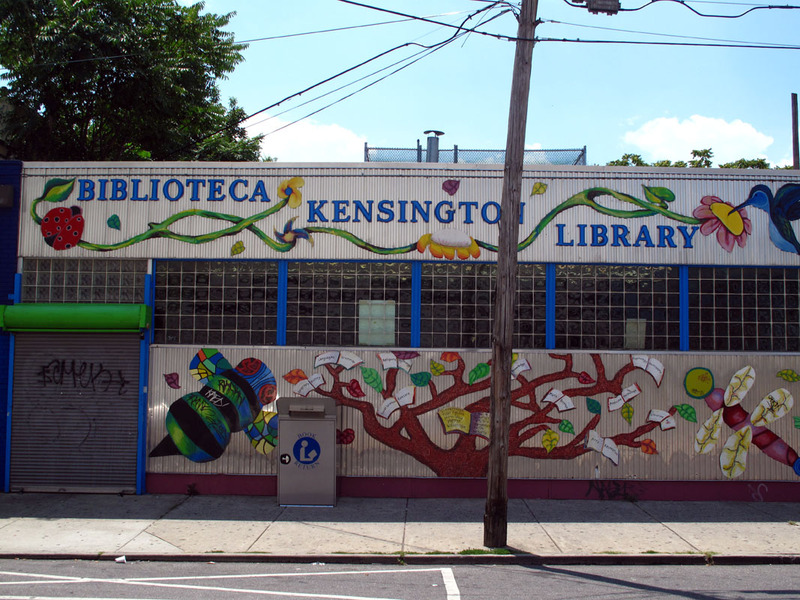 The Kensington branch was in one of the diciest neighborhoods of the trip. My medium format color camera had died in the heat of Detroit. Because this had to be a color photograph I had to photograph with the slow 4X5 camera. Walker hovered protectively and watched my back as I went under the dark cloth. Tough looking guys were beginning to gather on all corners of the street as I quickly took the photo and jumped back in the car. We skipped another library in this same rough neighborhood and drove to The Free Library of Philadelphia. This massive, elegant Main library was also a little faded. I spent three hours photographing its beauty and the content of its character. Ellen was back in our hotel working on another Kickstarter blast to help keep this project funded. Walker and I drove over to Camden, New Jersey to photograph their closed Main Library. 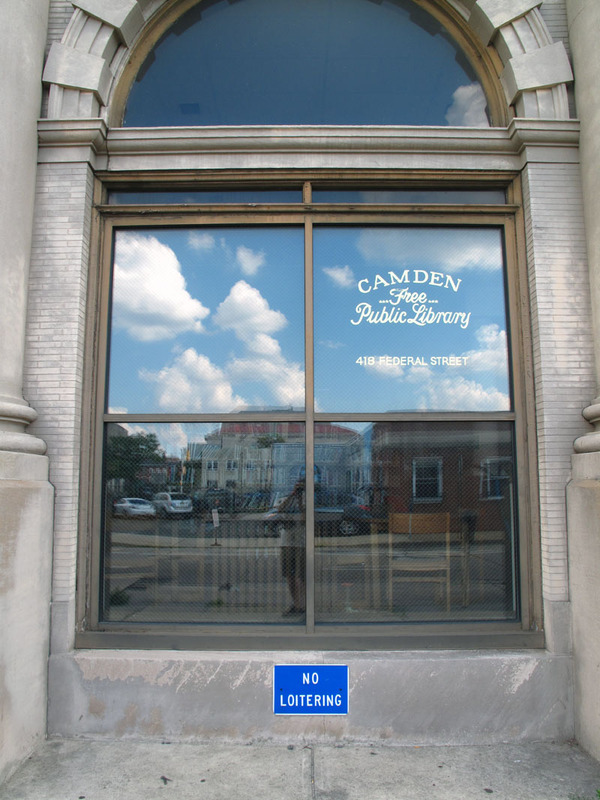 Camden is one of the few large cities in the country to close its entire library system. 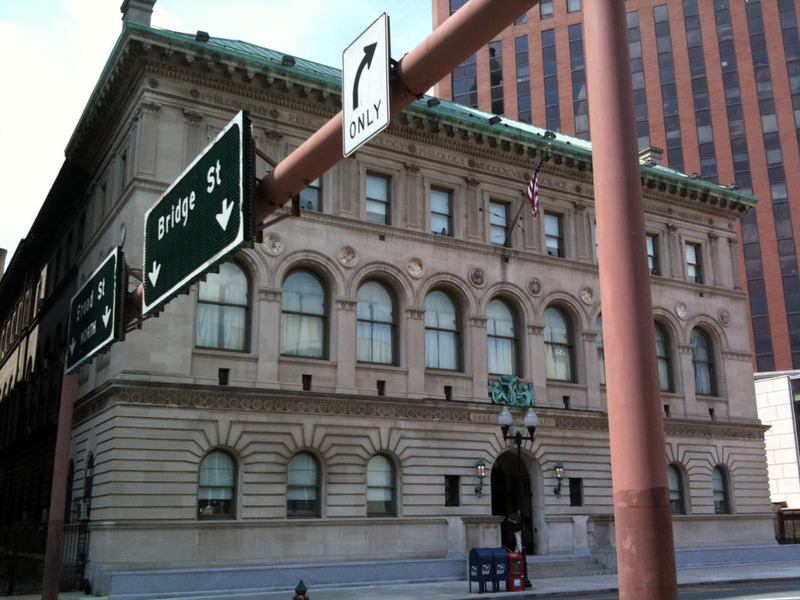 It has had a tough time recently with economic collapse and a famously corrupt city government. We saw the results of this in the closed library. 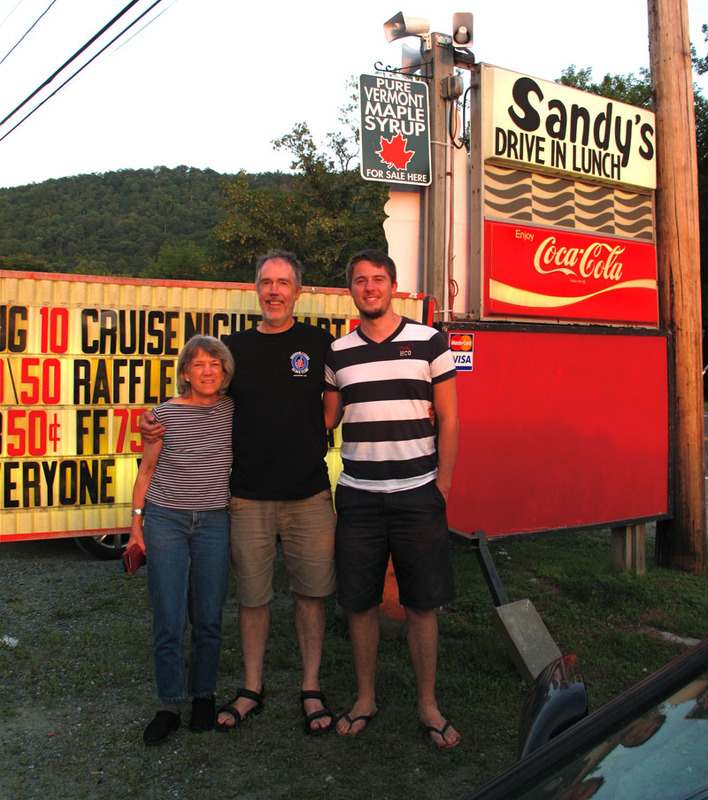 8/1/11 – As we had breakfast with out friend Stuart Rome and his family Walker took a bus to New York to hunt for an apartment for next year. Ellen and I made a quick stop in down-and-out Newark, NJ. I took what may be two good, quick shots of the exterior and then headed north to beat the traffic. We got past New York City and encountered an epic thunder and lighting storm near Waterbury, Connecticut. I skipped the library there and later we had to pull off the road to let this mega-storm pass. 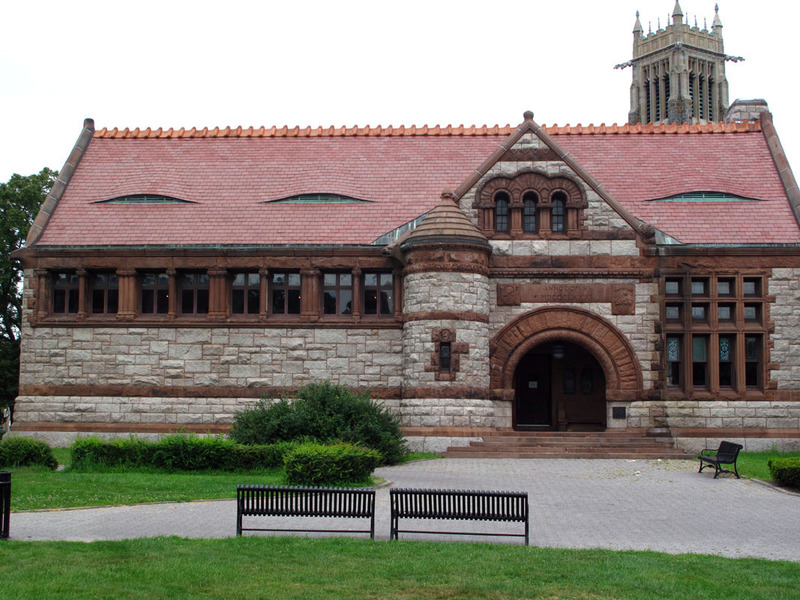 The last library I photographed in the fading light was in Longmeadow, Massachusetts. This was where our dear friend Leslie Leslie grew up. This small, patrician New England town was also part of the 19th Century Underground Railroad. It seemed appropriate to end this part of the project here. We then drove several more hours to our little cabin in the Vermont woods that we call the Farm arriving at 11 PM. Exhausted but happy I looked back on this amazing journey. 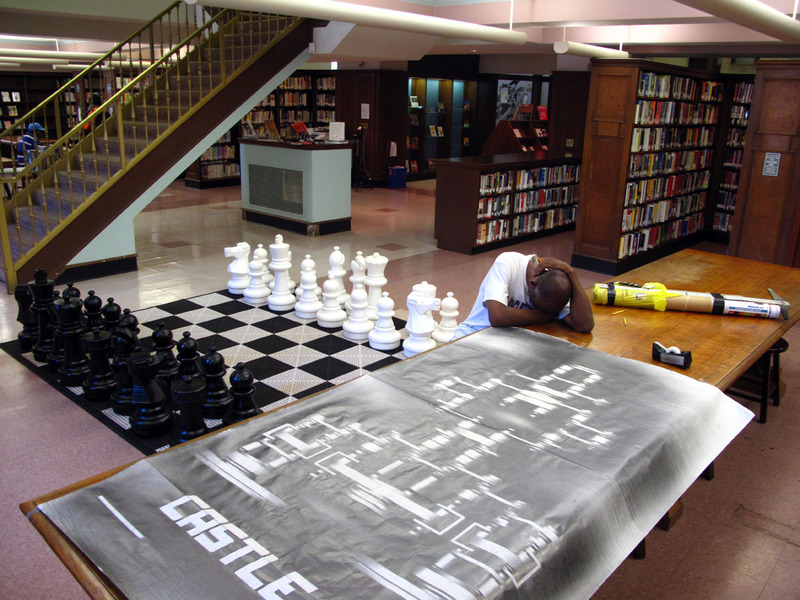 We had photographed over 180 public libraries in 39 days. We visited 19 states and drove 9,450 miles. 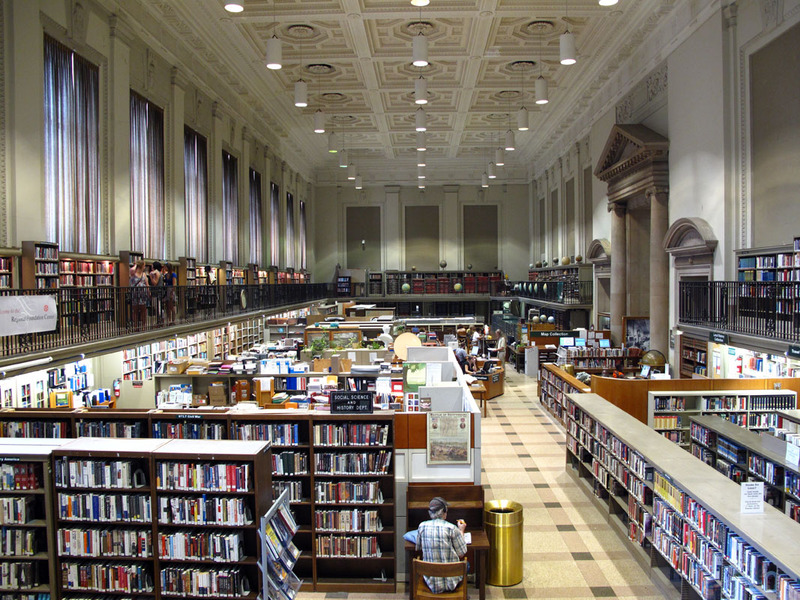 I will continue to photograph libraries in New England and New York over the next three weeks. But arriving at the Farm was the end of the big, non-stop push. We are off the grid at the Farm but I will continue to post blogs intermittently from the Howe Public Library in Hanover, New Hampshire. 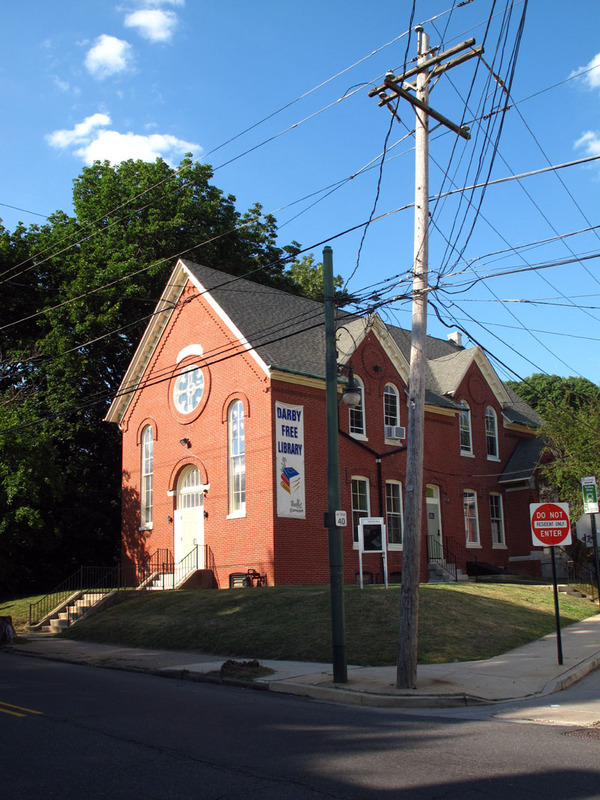 This is considered one of the best small public libraries in the country and Ellen’s family from the area has been heavily involved with the library. Walker and I both feel very positive about our public library system throughout the country despite the many problems. We will write more about these insights in the next few weeks. We also feel very positive about our country despite its problems. 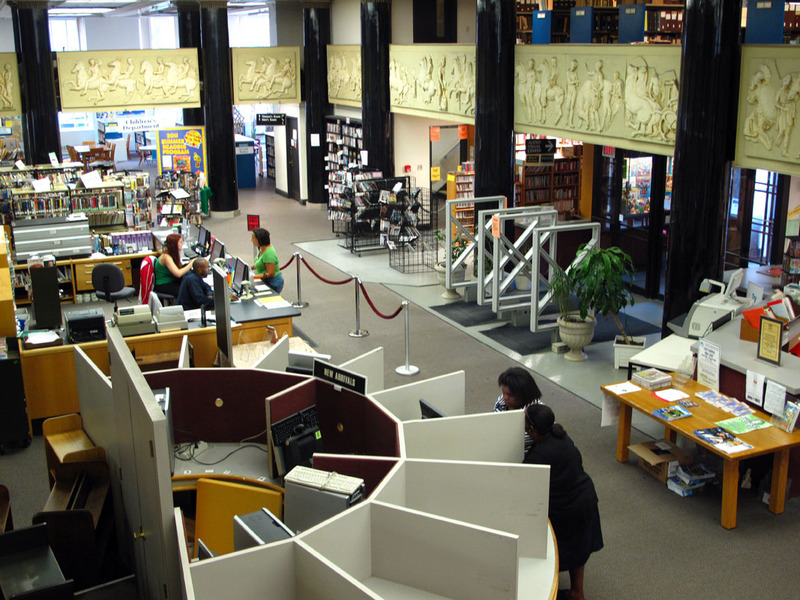 Most of the folks we met were hard-working people that loved their public libraries. In our divisive country this is one this we can all share. 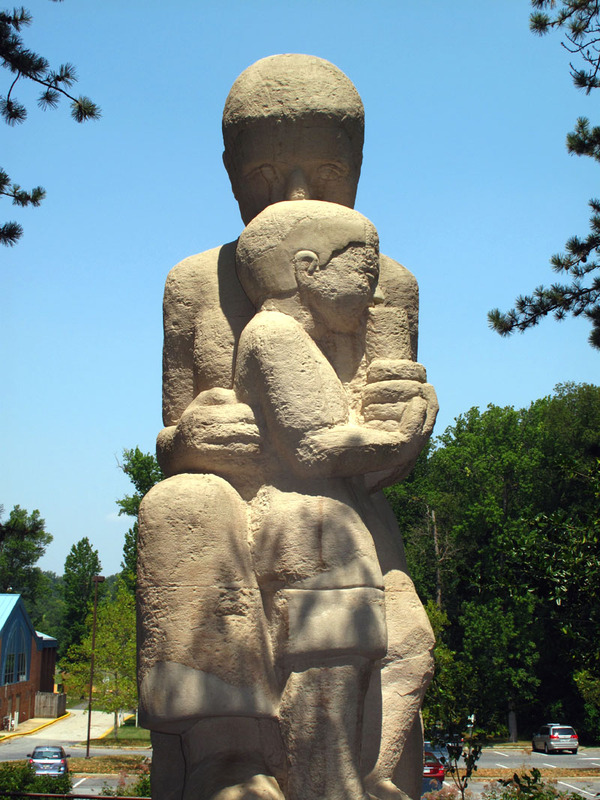 7/29/11 – North of DC is the planned community of Greenbelt, MD. It was built by the Roosevelt administration during the Great Depression. 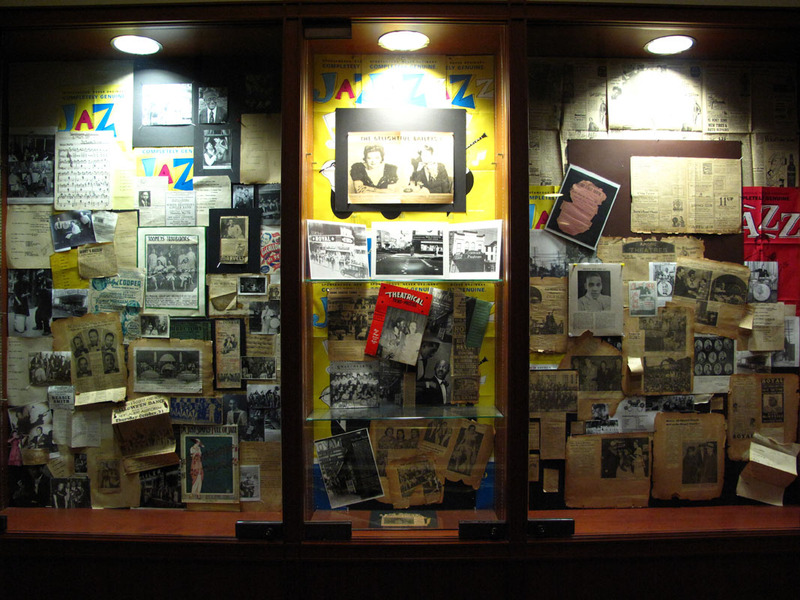 Eleanor Roosevelt took a special interest in it and visited several times. The town was built for unemployed workers from large urban slums. People had to apply to get in and it was considered a very desirable place for poor people to live. Roosevelt was sharply criticized for these few experiments in urban planning for being socialistic. The original library was built in a community center which still stands today with wonderful bas-relief sculpture on the outside. The contemporary library was built in the the 1970s and had a brutal exterior. Walker and I later had a long discussion on why a trained architect would design such a building, especially since it is surrounded by wonderful art-deco architecture and art. We stopped by the New Deal Cafe where I bought a great t-shirt. Later, as we reached Baltimore the temperature hit 104 degrees and the humidity was off the charts. We linger in our AC motel unwilling to face the heat one more time. 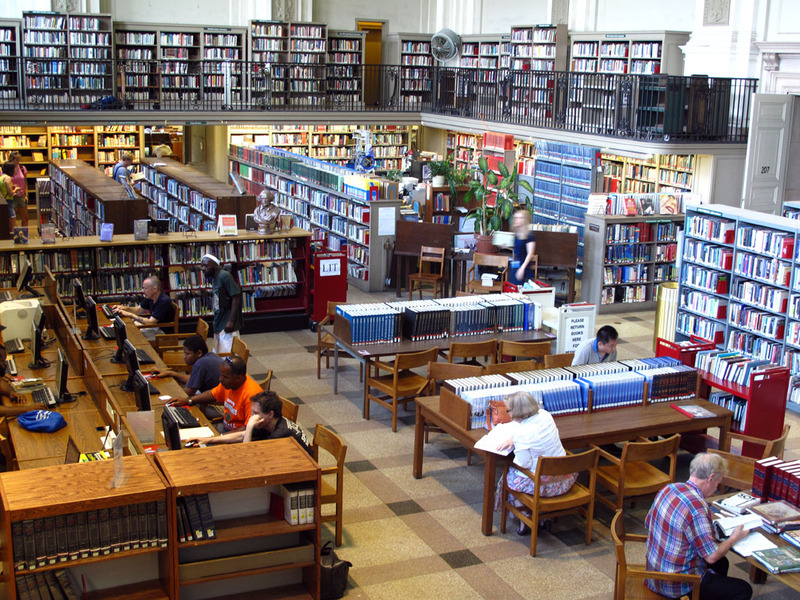 Finally, we dragged ourselves downtown to the Enoch Pratt Free Library. This large urban library turned out to be another gem. I spent an hour and a half happily running from floor to floor. I first scouted out sites with my small digital camera. 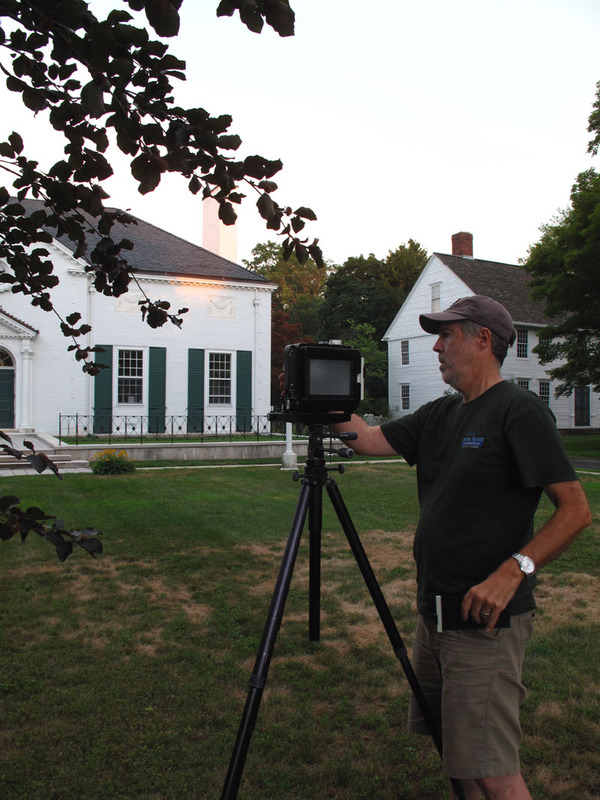 Then I was more efficient photographing with my large, heavy 4X5 camera and tripod. 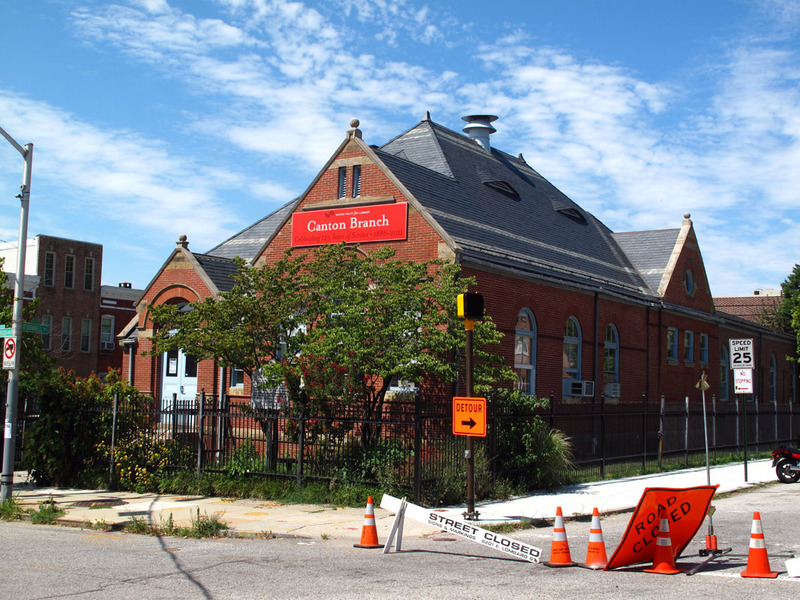 After the library closed I photographed the interesting Orleans Street branch library. We then went to the famous Baltimore landmark O’Brickies for some excellent seafood. Baltimore is another fascinating East Coast working-class city. We were warned how dangerous it was but we found it to be a vital, dynamic community. It is true that it filled with eccentrics and artists. Any town that is home to Edgar Allen Poe and John Waters has to be an original. It was refreshing to see it successfully reinventing itself. After a quick after-dinner walk in the heat by the harbor we end the evening changing film and blogging. through the evening heat on the streets of Philadelphia. Walker takes me over to historic Library Hall. I feel a deep patriotic emotion here having just crossed the country and having been to our nation’s capitol. It is interesting to contrast my emotions with the cheesy, immigrant-bashing, hyper patriotism of Joey Vento. Walker and I love this city but see some of its complexity as well. We drove to the airport and pick up my wife Ellen Manchester. She will join us for the rest of the trip.